@MRaymondJames @robertcarlyle_ NO!! YOU are a bowl if soup!! NO! @joshdallas is a BOWL OF SOUP! RT @jenmorrisonlive: @MRaymondJames @robertcarlyle_ NO!! YOU are a bowl if soup!! "@MRaymondJames: NO! @joshdallas is a BOWL OF SOUP! RT @jenmorrisonlive: @MRaymondJames @robertcarlyle_ NO! 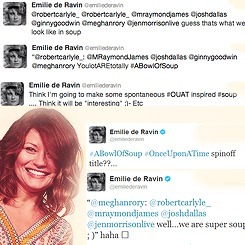 @ginnygoodwin is a BOWL OF SOUP! 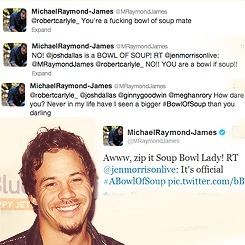 "@meghanrory: @robertcarlyle_ @mraymondjames @joshdallas @jenmorrisonlive well...we are super soup-y ; )" haha ?? 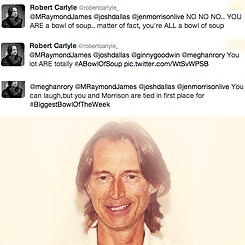 MT "@MRaymondJames: @robertcarlyle_ You're a bowl of soup mate"
@joshdallas @robertcarlyle_ Quiet Dallas! I'm going to be bringing a spoon tonight, because you are the BIGGEST #BowlOfSoup Boom. “@MRaymondJames: NO! @joshdallas is a BOWL OF SOUP! RT @jenmorrisonlive: @MRaymondJames @robertcarlyle_ NO! 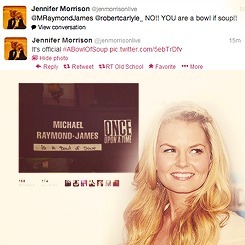 @ginnygoodwin is a BOWL OF SOUP! 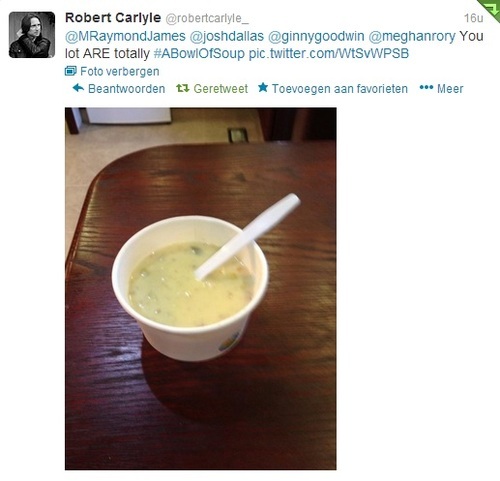 “@meghanrory: @robertcarlyle_ @mraymondjames @joshdallas @jenmorrisonlive well...we are super soup-y ; )” haha ? ?